1. 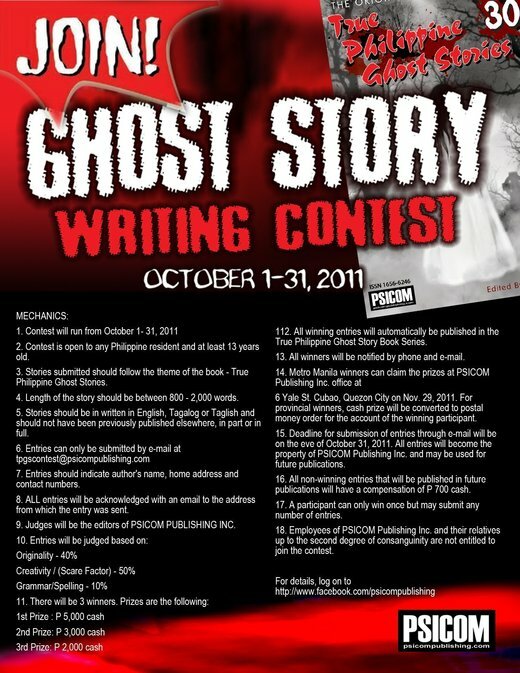 Contest will run from October 1- 31, 2011. 2. Contest is open to any Philippine resident and at least 13 years old. 3. Stories submitted should follow the theme of the book - True Philippine Ghost Stories. 4. Length of the story should be between 800-2,000 words. 5. Stories should be in written in English, Tagalog or Taglish and should not have been previously published elsewhere, in part or in full. 7. Entries should indicate author's name, home address and contact numbers. 8. ALL entries will be acknowledged with an email to the address from which the entry was sent. 9. Judges will be the editors of PSICOM PUBLISHING INC.
12. All winning entries will automatically be published in the True Philippine Ghost Story Book Series. 13. All winners will be notified by phone and e-mail. 6 Yale St. Cubao, Quezon City on Nov. 29, 2011. For provincial winners, cash prize will be converted to postal money order for the account of the winning participant. 15. Deadline for submission of entries through e-mail will be on the eve of October 31, 2011. All entries will become the property of PSICOM Publishing Inc. and may be used for future publications. 16. All non-winning entries that will be published in future publications will have a compensation of P 700 cash. 17. A participant can only win once but may submit any number of entries. 18. Employees of PSICOM Publishing Inc. and their relatives up to the second degree of consanguinity are not entitled to join the contest.